This car was purchased in Dec. of 1972. My grandfather like the car because it looked like a Cadillac. It was wreck at a body shop that my dad worked at. At first, my grandfather wasn't interested in the car, but as the car was repair, he began to like it and eventually bought the car. It had 24,000 miles after being fixed. It has a 350 V8. 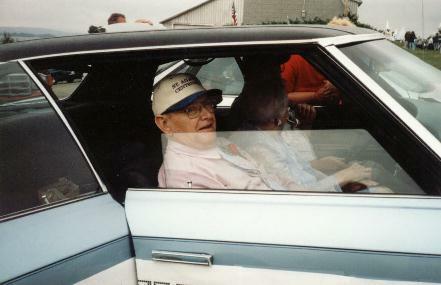 Below is a picture of my Grandfather in his car. The car now has a web site --->HERE.